Symphony in Bossa features more than 60 musicians, including The Jazz Orchestra of Philadelphia, conducted by trumpeter Terell Stafford. The album is augmented by a string section and many guest artists, including Brazilians Leonardo Lucini (bass), Adriano Santos (drums), Zé Maurício (percussion), and Philadelphia’s own Larry McKenna (saxophone), John Swana (trumpet) and Tony Salicandro (flute). Orchestral arrangements were written by the late Philadelphia arranger and University of the Arts professor Bill Zaccagni (Bobby Ridell, Patti LaBelle), specifically for Minas. 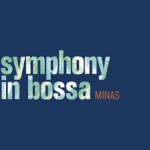 One of the tracks included on Symphony in Bossa is the timeless composition “The Girl From Ipanema.” The Minas reissue commemorates the 50th anniversary of the song, as well as the album from which it stems – the quintessential Getz/Gilberto. The album and single won several Grammy® Awards including “Record of the Year” in 1965. Minas’ version of “The Girl From Ipanema,” while opening and closing with dreamy and ethereal instrumentals, maintains the essential elements of authentic bossa novas: Portuguese/English, male/female vocals, jazz/samba mix, nylon-string guitar/tenor saxophone vibe, cross stick/wood block beat. Nonetheless it is presented in a new arrangement in which exciting big band and lush strings interact with vocal melody lines and dialogue with the tenor saxophone solo, played by McKenna.